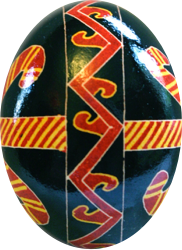 Eternity bands and other dividing elements on pysanky are composed of meanders, waves, lines and ribbons. For more detailed information and examples of pysanky with these motifs, go to the corresponding pages in the Meander Gallery. 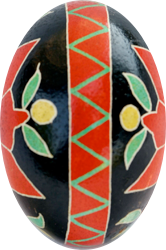 It is also one of the more common motifs on pysanky, for utilitarian as well as talismanic reasons. On the one hand, it can be used to divide the egg into sections, to separate one design from another. On the other, it has strong magical protective powers. 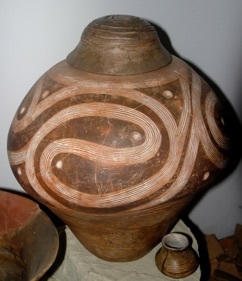 According to folk belief, the meander has a protective effect similar to that of a spiral. 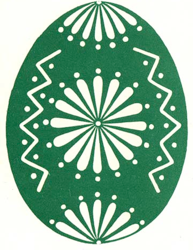 Since the meander on a pysanka has no beginning and no end, an evil spirit which happens to enter a house and lands on the egg is trapped forever, and will never bother the residents again. 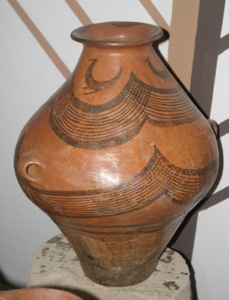 The meander itself symbolizes harmony, motion, infinity and immortality. According to Selivachov, the principle element of the bezkonechnyk is a closed spiral, and “the endless line symbolizes the incessant movement of the sun and of time in general.” He notes that the spiral is sometimes stylized as a zig-zag, although usually in modalities other than the pysanka. 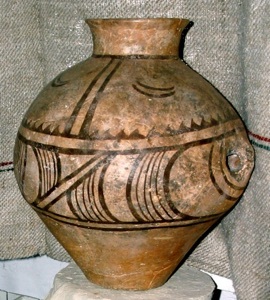 Meanders tend to be smaller in western Ukraine, where they usually serve as a border for the main design, and get larger in parts of central and eastern Ukraine, often encompassing the entire pysanka and becoming the main design element. Selivachov’s examples 1, 2 and 5 are obvious meanders; 3 and 4 are a more zig-zagged (and less fluid) version. 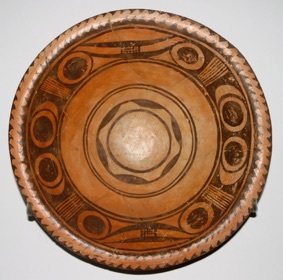 All are examples of the bezkonechnyk being the central motif, rather than just a decorative band. The pysanky directly below are similar in pattern to his first three examples. In some parts of Ukraine, particularly in those regions near the sea, meanders are referred to as waves. 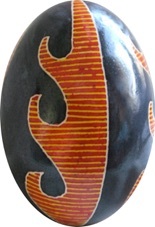 The pysanka below, «Хвилі» (“Waves”), is from the Odessa region, near the Black Sea. 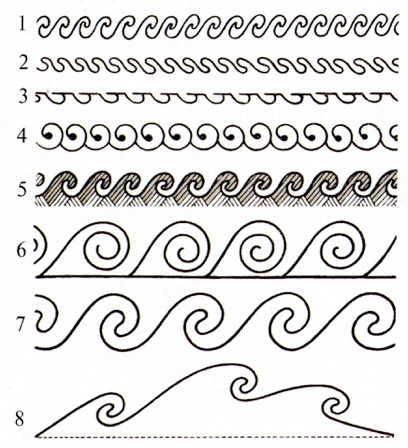 Curved, zig-zagging and wavy lines can represent the serpent and water, but they can also be simply «кривульки» (“kryvul’ky”), or crooked lines. No one can tell where the end is bound. No one can tell who's the last in line. Into the rose bush and kalyna we trail. The “crooked dance” is performed in a circular (as in illustration above) or, more commonly, a winding, snake-like manner, often around three trees, three stakes, or three boys. This sinuous movement is meant to imitate the rolling movement of the sun, its rising and its setting. This ancient, pre-Christian dance was performed for hours on Easter Sunday, by both maidens and matrons alike.